Aristotelian physics is a form of natural science described in the works of the Greek philosopher Aristotle (384–322 BCE). In the Physics, Aristotle established general principles of change that govern all natural bodies, both living and inanimate, celestial and terrestrial – including all motion, change with respect to place, change with respect to size or number, qualitative change of any kind; and "coming to be" (coming into existence, "generation") and "passing away" (no longer existing, "corruption"). nature is everywhere the cause of order. In claiming novelty for their doctrines, those natural philosophers who developed the “new science” of the seventeenth century frequently contrasted “Aristotelian” physics with their own. Physics of the former sort, so they claimed, emphasized the qualitative at the expense of the quantitative, neglected mathematics and its proper role in physics (particularly in the analysis of local motion), and relied on such suspect explanatory principles as final causes and “occult” essences. Yet in his Physics Aristotle characterizes physics or the “science of nature” as pertaining to magnitudes (megethê), motion (or “process” or “gradual change” – kinêsis), and time (chronon) (Phys III.4 202b30–1). Indeed, the Physics is largely concerned with an analysis of motion, particularly local motion, and the other concepts that Aristotle believes are requisite to that analysis. Unlike the eternal and unchanging celestial aether, each of the four terrestrial elements are capable of changing into either of the two elements they share a property with: e.g. the cold and wet (water) can transform into the hot and wet (air) or the cold and dry (earth) and any apparent change into the hot and dry (fire) is actually a two-step process. These properties are predicated of an actual substance relative to the work it is able to do; that of heating or chilling and of desiccating or moistening. The four elements exist only with regard to this capacity and relative to some potential work. The celestial element is eternal and unchanging, so only the four terrestrial elements account for "coming to be" and "passing away" – or, in the terms of Aristotle's De Generatione et Corruptione (Περὶ γενέσεως καὶ φθορᾶς), "generation" and "corruption". According to Aristotle, the elements which compose the terrestrial spheres are different from that constituting the celestial spheres. He believed that four elements make up everything under the Moon, i.e. everything terrestrial: earth, air, fire and water. [a] He also held that the heavens are made of a special weightless and incorruptible (i.e. unchangeable) fifth element called "aether". Aether also has the name "quintessence", meaning, literally, "fifth substance". 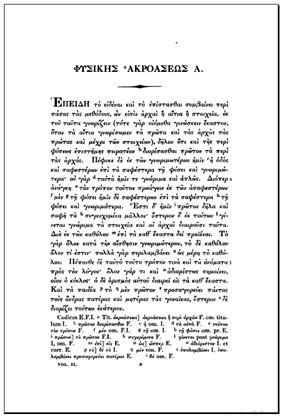 A page from an 1837 edition of the ancient Greek philosopher Aristotle's Physica, a book addressing a variety of subjects including the philosophy of nature and topics now part of its modern-day namesake: physics. Aristotle considered heavy substances such as iron and other metals to consist primarily of the element earth, with a smaller amount of the other three terrestrial elements. Other, lighter objects, he believed, have less earth, relative to the other three elements in their composition. The Sun, Moon, planets and stars – are embedded in perfectly concentric "crystal spheres" that rotate eternally at fixed rates. Because the celestial spheres are incapable of any change except rotation, the terrestrial sphere of fire must account for the heat, starlight and occasional meteorites. The lunar sphere is the only celestial sphere that actually comes in contact with the sublunary orb's changeable, terrestrial matter, dragging the rarefied fire and air along underneath as it rotates. Like Homer's æthere (αἰθήρ) – the "pure air" of Mount Olympus – was the divine counterpart of the air breathed by mortal beings (άήρ, aer). The celestial spheres are composed of the special element aether, eternal and unchanging, the sole capability of which is a uniform circular motion at a given rate (relative to the diurnal motion of the outermost sphere of fixed stars). The concentric, aetherial, cheek-by-jowl "crystal spheres" that carry the Sun, Moon and stars move eternally with unchanging circular motion. Spheres are embedded within spheres to account for the "wandering stars" (i.e. the planets, which, in comparison with the Sun, Moon and stars, appear to move erratically). Later, the belief that all spheres are concentric was forsaken in favor of Ptolemy's deferent and epicycle model. Aristotle submits to the calculations of astronomers regarding the total number of spheres and various accounts give a number in the neighborhood of fifty spheres. An unmoved mover is assumed for each sphere, including a "prime mover" for the sphere of fixed stars. The unmoved movers do not push the spheres (nor could they, being immaterial and dimensionless) but are the final cause of the spheres' motion, i.e. they explain it in a way that's similar to the explanation "the soul is moved by beauty". According to Aristotle, there are four ways to explain the aitia or causes of change. He writes that "we do not have knowledge of a thing until we have grasped its why, that is to say, its cause." Aristotle held that there were four kinds of causes. The material cause of a thing is that of which it is made. For a table, that might be wood; for a statue, that might be bronze or marble. “In one way we say that the aition is that out of which. as existing, something comes to be, like the bronze for the statue, the silver for the phial, and their genera” (194b2 3—6). By “genera,” Aristotle means more general ways of classifying the matter (e.g. “metal”; “material”); and that will become important. A little later on. he broadens the range of the material cause to include letters (of syllables), fire and the other elements (of physical bodies), parts (of wholes), and even premisses (of conclusions: Aristotle re-iterates this claim, in slightly different terms, in An. Post II. 11). The formal cause of a thing is the essential property that makes it the kind of thing it is. In Metaphysics Book Α Aristotle emphasizes that form is closely related to essence and definition. He says for example that the ratio 2:1, and number in general, is the cause of the octave. "Another [cause] is the form and the exemplar: this is the formula (logos) of the essence (to ti en einai), and its genera, for instance the ratio 2:1 of the octave” (Phys 11.3 194b26—8)... Form is not just shape... We are asking (and this is the connection with essence, particularly in its canonical Aristotelian formulation) what it is to be some thing. And it is a feature of musical harmonics (first noted and wondered at by the Pythagoreans) that intervals of this type do indeed exhibit this ratio in some form in the instruments used to create them (the length of pipes, of strings, etc.). In some sense, the ratio explains what all the intervals have in common, why they turn out the same. The efficient cause of a thing is the primary agency by which its matter took its form. For example, the efficient cause of a baby is a parent of the same species and that of a table is a carpenter, who knows the form of the table. In his Physics II, 194b29—32, Aristotle writes: "there is that which is the primary originator of the change and of its cessation, such as the deliberator who is responsible [sc. for the action] and the father of the child, and in general the producer of the thing produced and the changer of the thing changed". Aristotle’s examples here are instructive: one case of mental and one of physical causation, followed by a perfectly general characterization. But they conceal (or at any rate fail to make patent) a crucial feature of Aristotle’s concept of efficient causation, and one which serves to distinguish it from most modern homonyms. For Aristotle, any process requires a constantly operative efficient cause as long as it continues. This commitment appears most starkly to modern eyes in Aristotle’s discussion of projectile motion: what keeps the projectile moving after it leaves the hand? “Impetus,” “momentum,” much less “inertia,” are not possible answers. There must be a mover, distinct (at least in some sense) from the thing moved, which is exercising its motive capacity at every moment of the projectile’s flight (see Phys VIII. 10 266b29—267a11). Similarly, in every case of animal generation, there is always some thing responsible for the continuity of that generation, although it may do so by way of some intervening instrument (Phys II.3 194b35—195a3). The final cause is that for the sake of which something takes place, its aim or teleological purpose: for a germinating seed, it is the adult plant, for a ball at the top of a ramp, it is coming to rest at the bottom, for an eye, it is seeing, for a knife, it is cutting. Goals have an explanatory function: that is a commonplace, at least in the context of action-ascriptions. Less of a commonplace is the view espoused by Aristotle, that finality and purpose are to be found throughout nature. which is for him the realm of those things which contain within themselves principles of movement and rest (i.e. efficient causes); thus it makes sense to attribute purposes not only to natural things themselves, but also to their parts: the parts of a natural whole exist for the sake of the whole. As Aristotle himself notes, “for the sake of” locutions are ambiguous: "A is for the sake of B" may mean that A exists or is undertaken in order to bring B about; or it may mean that A is for B’s benefit (An II.4 415b2—3, 20—1); but both types of finality have, he thinks. a crucial role to play in natural. as well as deliberative, contexts. Thus a man may exercise for the sake of his health: and so “health,” and not just the hope of achieving it, is the cause of his action (this distinction is not trivial). But the eyelids are for the sake of the eye (to protect it: PA II.1 3) and the eye for the sake of the animal as a whole (to help it function properly: cf. An II.7). According to Aristotle, the science of living things proceeds by gathering observations about each natural kind of animal, organizing them into genera and species (the differentiae in History of Animals) and then going on to study the causes (in Parts of Animals and Generation of Animals, his three main biological works). The four causes of animal generation can be summarized as follows. The mother and father represent the material and efficient causes, respectively. The mother provides the matter out of which the embryo is formed, while the father provides the agency that informs that material and triggers its development. The formal cause is the definition of the animal’s substantial being (GA I.1 715a4: ho logos tês ousias). The final cause is the adult form, which is the end for the sake of which development takes place. The four elements make up the uniform materials such as blood, flesh and bone, which are themselves the matter out of which are created the non-uniform organs of the body (e.g. the heart, liver and hands) "which in turn, as parts, are matter for the functioning body as a whole (PA II. 1 646a 13—24)". [There] is a certain obvious conceptual economy about the view that in natural processes naturally constituted things simply seek to realize in full actuality the potentials contained within them (indeed, this is what is for them to be natural); on the other hand, as the detractors of Aristotelianism from the seventeenth century on were not slow to point out, this economy is won at the expense of any serious empirical content. Mechanism, at least as practiced by Aristotle’s contemporaries and predecessors, may have been explanatorily inadequate — but at least it was an attempt at a general account given in reductive terms of the lawlike connections between things. Simply introducing what later reductionists were to scoff at as “occult qualities” does not explain — it merely, in the manner of Molière’s famous satirical joke, serves to re-describe the effect. Formal talk, or so it is said, is vacuous. Things are not however quite as bleak as this. For one thing, there’s no point in trying to engage in reductionist science if you don’t have the wherewithal, empirical and conceptual, to do so successfully: science shouldn't be simply unsubstantiated speculative metaphysics. But more than that. there is a point to describing the world in such teleologically loaded terms: it makes sense of things in a way that atomist speculations do not. And further. Aristotle’s talk of species-forms is not as empty as his opponents would insinuate. He doesn't simply say that things do what they do because that's the sort of thing they do: the whole point of his classificatory biology, most clearly exemplified in PA, is to show what sorts of function go with what, which presuppose which and which are subservient to which. And in this sense, formal or functional biology is susceptible of a type of reductionism. We start, he tells us, with the basic animal kinds which we all pre-theoretically (although not indefeasibly) recognize (cf. PA I.4): but we then go on to show how their parts relate to one another: why it is, for instance that only blooded creatures have lungs, and how certain structures in one species are analogous or homologous to those in another (such as scales in fish, feathers in birds, hair in mammals). And the answers, for Aristotle, are to be found in the economy of functions, and how they all contribute to the overall well-being (the final cause in this sense) of the animal. According to Aristotle, perception and thought are similar, though not exactly alike in that perception is concerned only with the external objects that are acting on our sense organs at any given time, whereas we can think about anything we choose. Thought is about universal forms, in so far as they've been successfully understood, based on our memory of having encountered instances of those forms directly. Aristotle’s theory of cognition rests on two central pillars: his account of perception and his account of thought. Together, they make up a significant portion of his psychological writings, and his discussion of other mental states depends critically on them. These two activities, moreover, are conceived of in an analogous manner, at least with regard to their most basic forms. Each activity is triggered by its object – each, that is, is about the very thing that brings it about. This simple causal account explains the reliability of cognition: perception and thought are, in effect, transducers, bringing information about the world into our cognitive systems, because, at least in their most basic forms, they are infallibly about the causes that bring them about (An III.4 429a13–18). Other, more complex mental states are far from infallible. But they are still tethered to the world, in so far as they rest on the unambiguous and direct contact perception and thought enjoy with their objects. The Aristotelian explanation of gravity is that all bodies move toward their natural place. For the elements earth and water, that place is the center of the (geocentric) universe; the natural place of water is a concentric shell around the earth because earth is heavier; it sinks in water. The natural place of air is likewise a concentric shell surrounding that of water; bubbles rise in water. Finally, the natural place of fire is higher than that of air but below the innermost celestial sphere (carrying the Moon). In Book Delta of his Physics (IV.5), Aristotle defines topos (place) in terms of two bodies, one of which contains the other: a "place" is where the inner surface of the former (the containing body) touches the outer surface of the other (the contained body). This definition remained dominant until the beginning of the 17th century, even though it had been questioned and debated by philosophers since antiquity. The most significant early critique was made in terms of geometry by the 11th-century Arab polymath al-Hasan Ibn al-Haytham (Alhazen) in his Discourse on Place. Terrestrial objects rise or fall, to a greater or lesser extent, according to the ratio of the four elements of which they are composed. For example, earth, the heaviest element, and water, fall toward the center of the cosmos; hence the Earth and for the most part its oceans, will have already come to rest there. At the opposite extreme, the lightest elements, air and especially fire, rise up and away from the center. The elements are not proper substances in Aristotelian theory (or the modern sense of the word). Instead, they are abstractions used to explain the varying natures and behaviors of actual materials in terms of ratios between them. Motion and change are closely related in Aristotelian physics. Motion, according to Aristotle, involved a change from potentiality to actuality. He gave example of four types of change. Aristotle proposed that the speed at which two identically shaped objects sink or fall is directly proportional to their weights and inversely proportional to the density of the medium through which they move. While describing their terminal velocity, Aristotle must stipulate that there would be no limit at which to compare the speed of atoms falling through a vacuum, (they could move indefinitely fast because there would be no particular place for them to come to rest in the void). Now however it is understood that at any time prior to achieving terminal velocity in a relatively resistance-free medium like air, two such objects are expected to have nearly identical speeds because both are experiencing a force of gravity proportional to their masses and have thus been accelerating at nearly the same rate. This became especially apparent from the eighteenth century when partial vacuum experiments began to be made, but some two hundred years earlier Galileo had already demonstrated that objects of different weights reach the ground in similar times. Apart from the natural tendency of terrestrial exhalations to rise and objects to fall, unnatural or forced motion from side to side results from the turbulent collision and sliding of the objects as well as transmutation between the elements (On Generation and Corruption). In his Physics Aristotle examines accidents (συμβεβηκός, sumbebekos) that have no cause but chance. "Nor is there any definite cause for an accident, but only chance (τύχη, tukhe), namely an indefinite (ἀόριστον) cause" (Metaphysics V, 1025a25). It is obvious that there are principles and causes which are generable and destructible apart from the actual processes of generation and destruction; for if this is not true, everything will be of necessity: that is, if there must necessarily be some cause, other than accidental, of that which is generated and destroyed. Will this be, or not? Yes, if this happens; otherwise not (Metaphysics VI, 1027a29). 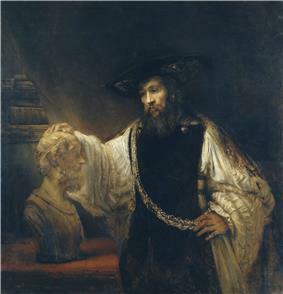 Aristotle argues against the indivisibles of Democritus (which differ considerably from the historical and the modern use of the term "atom"). As a place without anything existing at or within it, Aristotle argued against the possibility of a vacuum or void. Because he believed that the speed of an object's motion is proportional to the force being applied (or, in the case of natural motion, the object's weight) and inversely proportional to the viscosity of the medium, he reasoned that objects moving in a void would move indefinitely fast – and thus any and all objects surrounding the void would immediately fill it. The void, therefore, could never form. The "voids" of modern-day astronomy (such as the Local Void adjacent to our own galaxy) have the opposite effect: ultimately, bodies off-center are ejected from the void due to the gravity of the material outside. The ideal speed of a terrestrial object is directly proportional to its weight. In nature however, vacuum does not occur, the matter obstructing an object's path is a limiting factor that is inversely proportional to the viscosity of the medium. The Aristotelian theory of motion came under criticism and modification during the Middle Ages. 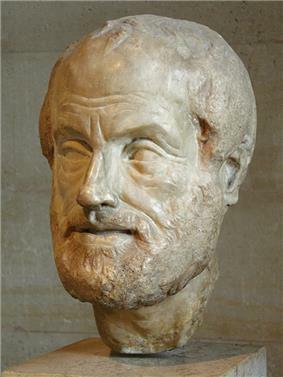 Modifications began with John Philoponus in the 6th century, who partly accepted Aristotle's theory that "continuation of motion depends on continued action of a force" but modified it to include his idea that a hurled body also acquires an inclination (or "motive power") for movement away from whatever caused it to move, an inclination that secures its continued motion. This impressed virtue would be temporary and self-expending, meaning that all motion would tend toward the form of Aristotle's natural motion. In The Book of Healing (1027), the 11th-century Persian polymath Avicenna developed Philoponean theory into the first coherent alternative to Aristotelian theory. Inclinations in the Avicennan theory of motion were not self-consuming but permanent forces whose effects were dissipated only as a result of external agents such as air resistance, making him "the first to conceive such a permanent type of impressed virtue for non-natural motion". Such a self-motion (mayl) is "almost the opposite of the Aristotelian conception of violent motion of the projectile type, and it is rather reminiscent of the principle of inertia, i.e. Newton's first law of motion." The eldest Banū Mūsā brother, Ja'far Muhammad ibn Mūsā ibn Shākir (800-873), wrote the Astral Motion and The Force of Attraction. The Persian physicist, Ibn al-Haytham (965-1039) discussed the theory of attraction between bodies. It seems that he was aware of the magnitude of acceleration due to gravity and he discovered that the heavenly bodies "were accountable to the laws of physics". The Persian polymath Abū Rayhān al-Bīrūnī (973-1048) was the first to realize that acceleration is connected with non-uniform motion (as later expressed by Newton's second law of motion). During his debate with Avicenna, al-Biruni also criticized the Aristotelian theory of gravity firstly for denying the existence of levity or gravity in the celestial spheres; and, secondly, for its notion of circular motion being an innate property of the heavenly bodies. In 1121, al-Khazini, in The Book of the Balance of Wisdom, proposed that the gravity and gravitational potential energy of a body varies depending on its distance from the centre of the Earth. Hibat Allah Abu'l-Barakat al-Baghdaadi (1080–1165) wrote al-Mu'tabar, a critique of Aristotelian physics where he negated Aristotle's idea that a constant force produces uniform motion, as he realized that a force applied continuously produces acceleration, a fundamental law of classical mechanics and an early foreshadowing of Newton's second law of motion. Like Newton, he described acceleration as the rate of change of speed. "The small or large rock will fall to the Earth along the path of a line that is perpendicular to the plane (sath) of the horizon; this is witnessed by experience (tajriba). And this perpendicular is away from the tangent point of the Earth’s sphere and the plane of the perceived (hissi) horizon. This point moves with the motion of the Earth and thus there will be no difference in place of fall of the two rocks." The reign of Aristotelian physics, the earliest known speculative theory of physics, lasted almost two millennia. After the work of many pioneers such as Copernicus, Galileo, Descartes and Newton, it became generally accepted that Aristotelian physics was neither correct nor viable. Despite this, it survived as a scholastic pursuit well into the seventeenth century, until universities amended their curricula. In Europe, Aristotle's theory was first convincingly discredited by Galileo's studies. Using a telescope, Galileo observed that the Moon was not entirely smooth, but had craters and mountains, contradicting the Aristotelian idea of the incorruptibly perfect smooth Moon. Galileo also criticized this notion theoretically; a perfectly smooth Moon would reflect light unevenly like a shiny billiard ball, so that the edges of the moon's disk would have a different brightness than the point where a tangent plane reflects sunlight directly to the eye. A rough moon reflects in all directions equally, leading to a disk of approximately equal brightness which is what is observed. Galileo also observed that Jupiter has moons – i.e. objects revolving around a body other than the Earth – and noted the phases of Venus, which demonstrated that Venus (and, by implication, Mercury) traveled around the Sun, not the Earth. According to legend, Galileo dropped balls of various densities from the Tower of Pisa and found that lighter and heavier ones fell at almost the same speed. His experiments actually took place using balls rolling down inclined planes, a form of falling sufficiently slow to be measured without advanced instruments. In a relative dense medium such as water, a heavier body falls faster than a lighter one. This led Aristotle to speculate that the rate of falling is proportional to the weight and inversely proportional to the density of the medium. From his experience with objects falling in water, he concluded that water is approximately ten times denser than air. By weighing a volume of compressed air, Galileo showed that this overestimates the density of air by a factor of forty. From his experiments with inclined planes, he concluded that if friction is neglected, all bodies fall at the same rate. Galileo also advanced a theoretical argument to support his conclusion. He asked if two bodies of different weights and different rates of fall are tied by a string, does the combined system fall faster because it is now more massive, or does the lighter body in its slower fall hold back the heavier body? The only convincing answer is neither: all the systems fall at the same rate. ...with the condition that y(0)=0. Galileo demonstrated that this system would stay at y=0 for all time. If a perturbation set the system into motion somehow, the object would pick up speed exponentially in time, not quadratically. Standing on the surface of the Moon in 1971, David Scott famously repeated Galileo's experiment by dropping a feather and a hammer from each hand at the same time. In the absence of a substantial atmosphere, the two objects fell and hit the Moon's surface at the same time. The first convincing mathematical theory of gravity – in which two masses are attracted toward each other by a force whose effect decreases according to the inverse square of the distance between them – was Newton's law of universal gravitation. This, in turn, was replaced by the General theory of relativity due to Albert Einstein. Minima naturalia, a hylomorphic concept suggested by Aristotle broadly analogous in Peripatetic and Scholastic physical speculation to the atoms of Epicureanism. a ^ Here, the term "Earth" does not refer to planet Earth, known by modern science to be composed of a large number of chemical elements. Modern chemical elements are not conceptually similar to Aristotle's elements; the term "air", for instance, does not refer to breathable air. ^ Lang, H.S. (2007). The Order of Nature in Aristotle's Physics: Place and the Elements. Cambridge University Press. p. 290. ^ White, Michael J. (2009). "Aristotle on the Infinite, Space, and Time". Blackwell Companion to Aristotle. p. 260. ^ "Physics of Aristotle vs. The Physics of Galileo". Archived from the original on 11 April 2009. Retrieved 6 April 2009. ^ a b "www.hep.fsu.edu" (PDF). Retrieved 26 March 2007. ^ a b c "Aristotle's physics". Retrieved 6 April 2009. ^ Sorabji, R. (2005). The Philosophy of the Commentators, 200-600 AD: Physics. G - Reference, Information and Interdisciplinary Subjects Series. Cornell University Press. p. 352. ^ a b "Four Causes". Falcon, Andrea. Aristotle on Causality. Stanford Encyclopedia of Philosophy 2008. ^ Aristotle, "Book 5, section 1013a", Metaphysics, Hugh Tredennick (trans.) Aristotle in 23 Volumes, Vols. 17, 18, Cambridge, MA, Harvard University Press; London, William Heinemann Ltd. 1933, 1989; (hosted at perseus.tufts.edu.) Aristotle also discusses the four causes in his Physics, Book B, chapter 3. ^ a b Hankinson, R.J. "The Theory of the Physics". Blackwell Companion to Aristotle. p. 216. ^ a b Hankinson, R.J. "Causes". Blackwell Companion to Aristotle. p. 217. ^ Aristotle. Parts of Animals I.1. ^ Hankinson, R.J. "Causes". Blackwell Companion to Aristotle. p. 218. ^ a b Henry, Devin M. (2009). "Generation of Animals". Blackwell Companion to Aristotle. p. 368. ^ Hankinson, R.J. "Causes". Blackwell Companion to Aristotle. p. 222. ^ a b Caston, Victor (2009). "Phantasia and Thought". Blackwell Companion to Aristotle. pp. 322–2233. ^ De Caelo II. 13-14. ^ For instance, by Simplicius in his Corollaries on Place. ^ El-Bizri, Nader (2007). "In Defence of the Sovereignty of Philosophy: al-Baghdadi's Critique of Ibn al-Haytham's Geometrisation of Place". Arabic Sciences and Philosophy (Cambridge University Press) 17: 57–80. ^ Bodnar, Istvan, "Aristotle's Natural Philosophy" in The Stanford Encyclopedia of Philosophy (Spring 2012 Edition, ed. Edward N. Zalta). ^ Gindikin, S.G. (1988). Tales of Physicists and Mathematicians. Birkh. p. 29. ^ Lindberg, D. (2008), The beginnings of western science: The European scientific tradition in philosophical, religious, and institutional context, prehistory to AD 1450 (2nd ed. ), University of Chicago Press. ^ Land, Helen, The Order of Nature in Aristotle's Physics: Place and the Elements (1998). ^ Tully; Shaya; Karachentsev; Courtois; Kocevski; Rizzi; Peel (2008). "Our Peculiar Motion Away From the Local Void". The Astrophysical Journal 676 (1): 184. According to Aristotle, continuation of motion depends on continued action of a force. The motion of a hurled body, therefore, requires elucidation. Aristotle maintained that the air of the atmosphere was responsible for the continuation of such motion. John Philoponos of the 6th century rejected this Aristotelian view. He claimed that the hurled body acquires a motive power or an inclination for forced movement from the agent producing the initial motion and that this power or condition and not the ambient medium secures the continuation of such motion. According to Philoponos this impressed virtue was temporary. It was a self-expending inclination, and thus the violent motion thus produced comes to an end and changes into natural motion. Ibn Sina adopted this idea in its rough outline, but the violent inclination as he conceived it was a non-self-consuming one. It was a permanent force whose effect got dissipated only as a result of external agents such as air resistance. He is apparently the first to conceive such a permanent type of impressed virtue for non-natural motion. [...] Indeed, self-motion of the type conceived by Ibn Sina is almost the opposite of the Aristotelian conception of violent motion of the projectile type, and it is rather reminiscent of the principle of inertia, i.e., Newton's first law of motion. ^ Duhem, Pierre (1908, 1969). To Save the Phenomena: An Essay on the Idea of Physical theory from Plato to Galileo, University of Chicago Press, Chicago, p. 28. ^ Rafik Berjak and Muzaffar Iqbal, "Ibn Sina--Al-Biruni correspondence", Islam & Science, June 2003. ^ Gutman, Oliver (2003). Pseudo-Avicenna, Liber Celi Et Mundi: A Critical Edition. ^ a b Galileo Galilei, Dialogue Concerning the Two Chief World Systems. ^ a b Galileo Galilei, Two New Sciences. Ragep, F. Jamil; Al-Qushji, Ali (2001b). "Freeing Astronomy from Philosophy: An Aspect of Islamic Influence on Science". Osiris, 2nd Series 16 (Science in Theistic Contexts: Cognitive Dimensions): 49–64 and 66–71. H. Carteron (1965) "Does Aristotle Have a Mechanics?" in Articles on Aristotle 1. Science eds. Jonathan Barnes, Malcolm Schofield, Richard Sorabji (London: General Duckworth and Company Limited), 161-174. Katalin Martinás, “Aristotelian Thermodynamics” in Thermodynamics: history and philosophy: facts, trends, debates (Veszprém, Hungary 23–28 July 1990), pp. 285–303.